World War II spawned enormous technological advancement and, by the late 1940s, the ‘Knucklehead’ (Harley-Davidson’s first overhead-valve, twin-cylinder roadster) was showing its age, albeit gracefully. 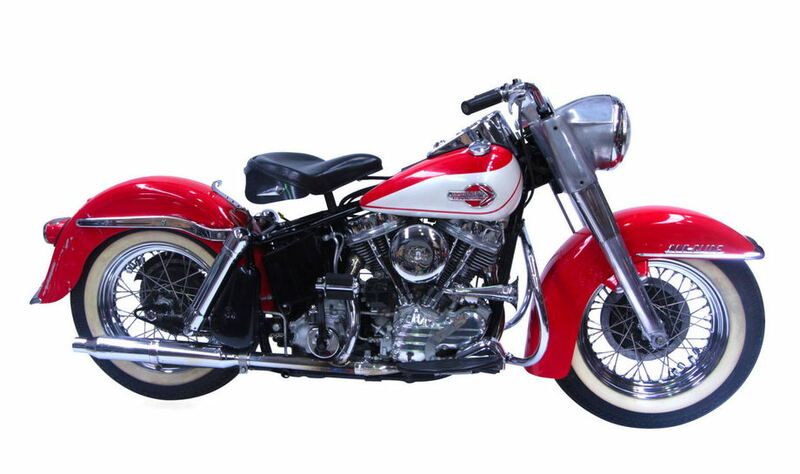 Commissioning a wholesale review, HD released the now-legendary Panhead in 1948. While the engine’s bottom end remained fundamentally unchanged, aka bulletproof, the top end gained aluminium cylinder heads and those distinctive pan-shaped rocker covers. The oil lines were internalised and hydraulic valve lifters adopted; these were innovations that greatly reduced tappet noise and simplified maintenance. With an improved cooling system, the Pan delivered 50hp that translated into deep low-down power and effortless high cruise speeds. However, the main advantage of the many improvements was greater reliability, a factor that would extend the Harley’s appeal inter-generationally. For many, the Panhead engine is the most aesthetically pleasing powerplant Harley-Davidson Motor Company has ever made; further still, between 1960 and 1965, the Milwaukee design team seemed to hit a synergy that produced some of the most-resolved motorcycles ever produced such as the FL Duo Glide. From an engineering perspective, they were proper and the look and feel captured a sense of time for the American public that echoed the very best of the 1930s and the hopes and aspirations of a new decade that promised change. Owner’s Statement: Here we have a restored and run-in 1960 FLH Panhead FLH Duo Glide. I bought this bike off a guy who had owned it since 1962, and had ridden it daily for a solid 30 years; he had just finished a strip-back to the frame, a stress test and rebuild from the ground up. The mileage was only on 300 miles when I purchased it and rode it from New York to Los Angeles. The guy thought he would never sell it and neither did his friends as it was always there ready for service. He stated that, until he pulled it down, the heads had never been off nor the cases been apart. The only work it had required in all those years was general maintenance and a couple of generators. The sad part comes that, by the time he finished the completely stock, wheels-up rebuild, with added compression and an ageing hip (he was in his mid-60s), it was just getting a little hard for him to kick. He knows he could have done an electric starter conversion but that, to him, would be disrespectful as his comrade was not the one failing. He saw no reason to change and stayed with the six-volt system. Why change? It had got him this far with no one complaining. But to see his mate just sit and gather dust just didn’t wash with him; it was built to ride, not to sit inside. So that’s where I came along; I always like a ride with a story and pride. So I and a mate rode across the USA, on a 70 Bonnie and this 60 Panhead; it’s times like that that you realise you’re a long time dead. So the bike was broken in in a way it could only dream of. It rode like it sounds: really good and was made for those roads, man. It was happy doing 50 to 70; it would probably do it for another 30 years. At every bike shop we visited, everyone said, 'nice pan, man; finding one so stock is not so easy'. All tin from the bike, numbers match obviously, a couple of paint scrapes, a little oil leak, but that’s it: nothing nasty. It has a new seat and screen, original bubble bags painted black (which looks way better and makes sense as white doesn’t last) and good tyres; it might need a new chain and a tune-up and oil change as I can’t quite remember when those things were last done. It is sold with US title as I have never registered it in New Zealand; but there is no problem as I have got all that you need and it’s vintage so there is a minimal fee. I hope someone buys it who loves it as it’s been all good to me. See the photos and, if there is anything else, just ask. If you want an honest pan, ready to serve, then this is your man. Also, it comes with correct bubble bags and windscreen.